Minor League Baseball set a new record with more than $70.8 million in retail sales in 2017. 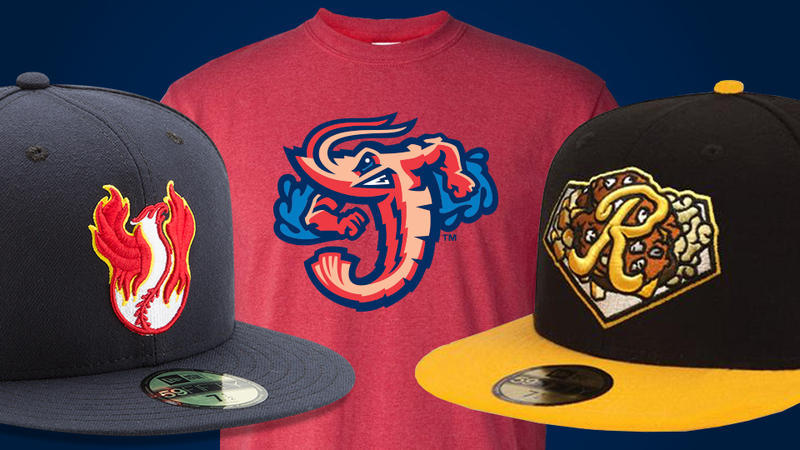 ST. PETERSBURG, Fla. -- Minor League Baseball today announced its list of Top 25 teams in licensed merchandise sales for 2017, with the combined totals of all 160 teams setting a Minor League Baseball record with more than $70.8 million in retail sales. The $70.8 million total marks a 3.6 percent increase over 2016's total of $68.3 million, which had been the highest total recorded since Minor League Baseball's licensing program began in 1992. The numbers are based on total licensed merchandise sales from January 1 - December 31, 2017, and include the 160 teams that charge admission to their games. The Top 25 list includes (alphabetically, with Major League affiliate): Albuquerque Isotopes (Rockies), Buffalo Bisons (Blue Jays), Charlotte Knights (White Sox), Columbia Fireflies (Mets), Columbus Clippers (Indians), Durham Bulls (Rays), El Paso Chihuahuas (Padres), Fort Wayne TinCaps (Padres), Frisco RoughRiders (Rangers), Hartford Yard Goats (Rockies), Indianapolis Indians (Pirates), Jacksonville Jumbo Shrimp (Marlins), Lehigh Valley IronPigs (Phillies), Nashville Sounds (Athletics), New Orleans Baby Cakes (Marlins), Omaha Storm Chasers (Royals), Portland SeaDogs (Red Sox), Reading Fightin Phils (Phillies), Rochester Red Wings (Twins), Sacramento River Cats (Giants), Salt Lake Bees (Angels), South Bend Cubs, Tacoma Rainiers (Mariners), Toledo Mud Hens (Tigers) and Trenton Thunder (Yankees). The Albuquerque Isotopes, Buffalo Bisons, Fort Wayne TinCaps, Hartford Yard Goats, Jacksonville Jumbo Shrimp, New Orleans Baby Cakes, Reading Fightin Phils and Rochester Red Wings made the list in 2017 after not making the Top 25 in 2016. Six teams have made the list every year of their existence, or since the program began in 1993: Columbia Fireflies (two years), Durham Bulls (25 years), El Paso (four years), Lehigh Valley Iron Pigs (11 years), Sacramento River Cats (18 years) and Trenton Thunder (24 years). Twenty-one different major league organizations were represented by teams on the list, with only the Colorado Rockies, Miami Marlins, Philadelphia Phillies and San Diego Padres placing two affiliates in the Top 25. The South Bend Cubs were the only team to make the list using the nickname of their major league affiliate. "Minor League Baseball team names and logos continue to be among the most popular in all of professional sports and our teams have made promoting their brand a priority for their respective organizations," said Brian Earle, Minor League Baseball's Chief Operating Officer. "The teams have done a tremendous job of using their team marks and logos to build an identity that is appealing to fans not just locally, but in some cases, globally as well." Minor League Baseball's licensing partners, led by New Era Cap, 47 Brand, Bimm Ridder, Majestic/Fanatics, Original Retro Brand, Outdoor Cap and Nike, continue to support its growth through innovative designs that meet consumer demand. "The increase in popularity of Minor League Baseball logos, combined with high-quality product design and superior manufacturing capabilities of these licensees, has provided MiLB with a vehicle for current and future growth," said Earle.